Simple pleasures are certainly the best! Our boat seemed to be speeding up for a nice 15 minutes until we realized that we are actually running at a normal speed. It was an amazing climb at Mount Pundaquit. I thought Anawangin is cool too. 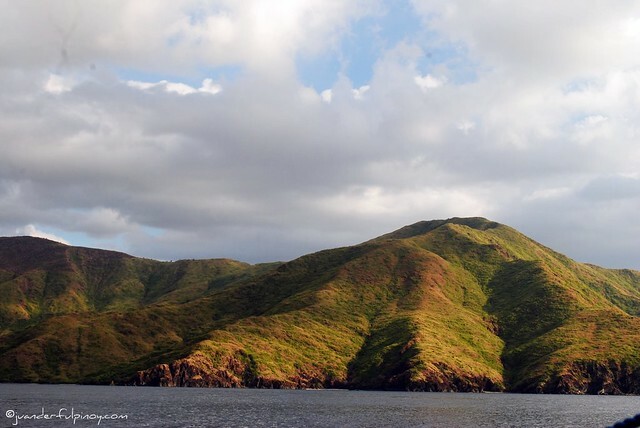 It would take another 20-30 minutes to reach the island of Nagsasa. Paradise was so near and we were very excited about it. 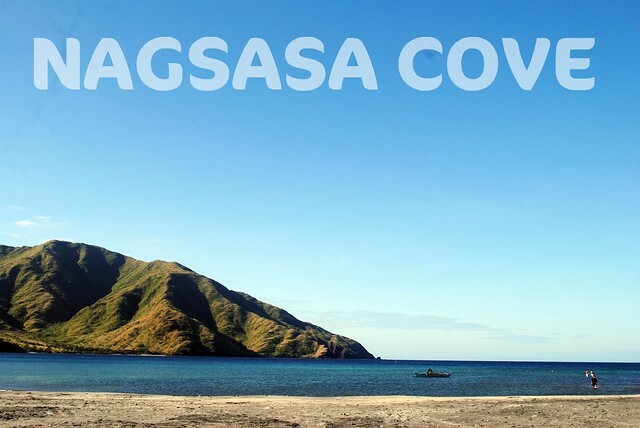 Nagsasa cove is truly a breath of fresh air. 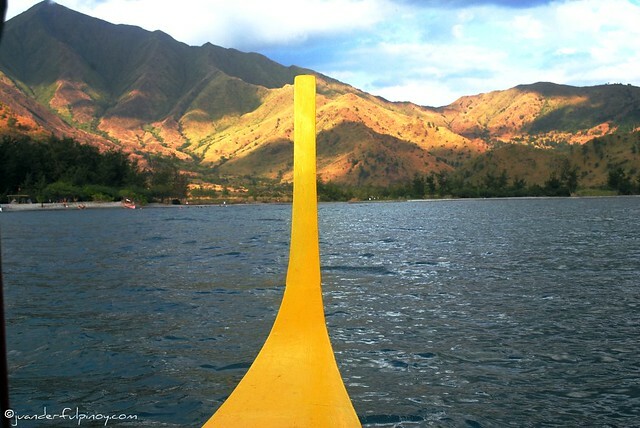 We chose Nagsasa over Anawangin for very simple reasons. 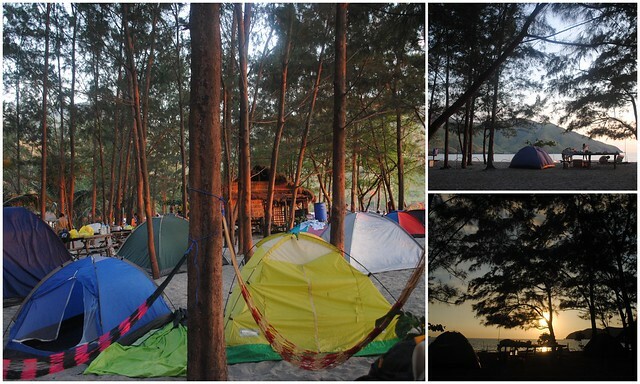 Campers in Nagsasa is considerably lesser than Anawangin cove. Baka naman magmukha kaming sardinas sa sikip. I experienced camping once. That was I guess a year ago. And I did not like camping. The thought of camping makes me allergic to it. I would rather enjoy a very comfortable bed , good food to eat and relaxing experience. But that was before! Until , I learned something when we camped there and stayed for the whole night enjoying the wildlife and the beauty of nature. It was certainly one of the best camping experiences. Thanks to the birthday boy Ivan . 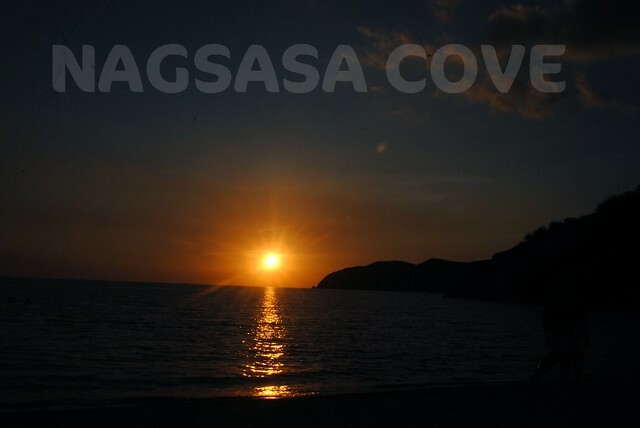 It was actually late in the afternoon when we arrived at the fine sand of Paradise called Nagsasa Cove. Nalipasan na ata kami ng gutom . We had an early morning , lunch and dinner actually ( nagsanib pwersa na sila), it was a chicken meal we bought in a cafeteria at San Antonio Market. Actually lunch talaga yun. We had lunch in our own suites under large trees. Afterwards, we began setting our mini camp. Stairing at them preparing and setting up our camp , pitching the tents made me think how simple it is to look at but hard to set up when you are trying to do it on your own. Nagsasa doesn’t offer an accommodation. There’s no fan or air-conditioning but nobody needs it anyway . We’ve got fresh air everywhere. Sarap ! It was a pleasant afternoon . It was not really enough for us to feel the sand between our toes and water on our skin. Ang sarap lang magbabad sa tubig.But we decided to enjoy the sparkling blue ocean the next day. Magprepare pa kasi kami ng dinner. The sun has about to fade so I grabbed my camera and started shooting the sun as it about to turn pale tint of orange. Everyone of us marveled at the beautiful red and orange colors of sunset. 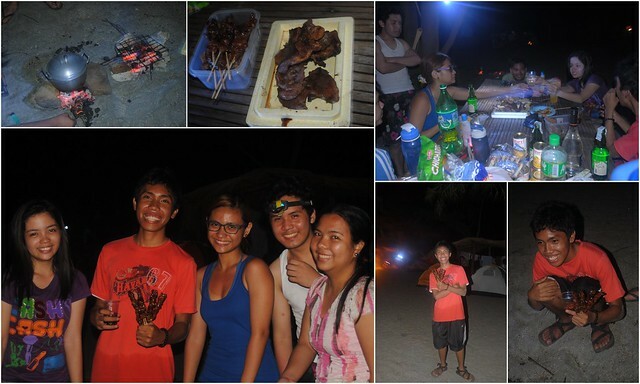 We’re spending the entire night at this island Yehey! Again our mobile phones were totally useless .Phone signals were out. We hurried and prepared for our dinner. It was a yummy grilled pork chop. We had fresh tilapia , unfortunately we forgot to put ice on it. Hayun , nasira, bibigay nalang namin kay Bulatino! ( stray puppy we encountered at Nagsasa) Sayang diba? Anyway, The great part here was, a nice and generous neighboring campers shared us a few sticks of barbeques and grilled fish. ( Naawa siguro sa min kasi gutom na gutom na kami ). The people you spend most of your time with are important so choose them wisely. Thanks guys! It was entirely a special evening so we thought of enjoying a conversation with a soft liquor. 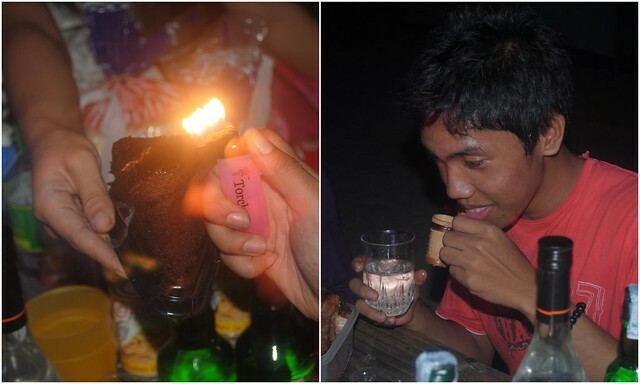 I found out that a good combination of alcohol to mix with it would be exchanging of horror stories. hahaha. I actually freaked out! At first ok yung mga stories , Pero hindi ko na ikukuwento dito. Nagsasa cove maybe small , but I think it’s definitely far from being boring. We enjoyed the photo shoot, in fact we attempted shooting numerous times. The great adventure actually started after a joyous Delata meal (canned goods) for breakfast. 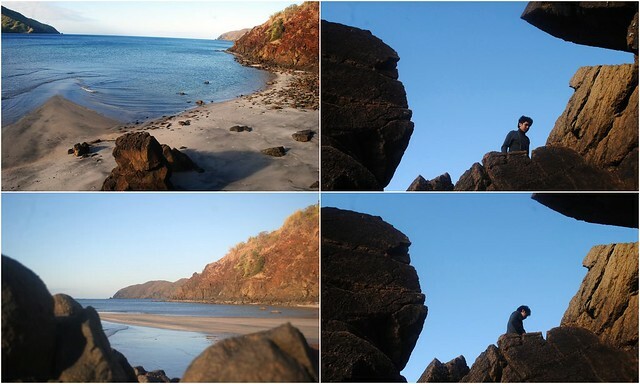 And then we finally made a closer look at Nagsasa Cove. I just love the lake with a rolling mountains as its backdrop . Saya lang ng feeling. The lake offers an endless bliss and opportunities for us to enjoy , play and explore nature. 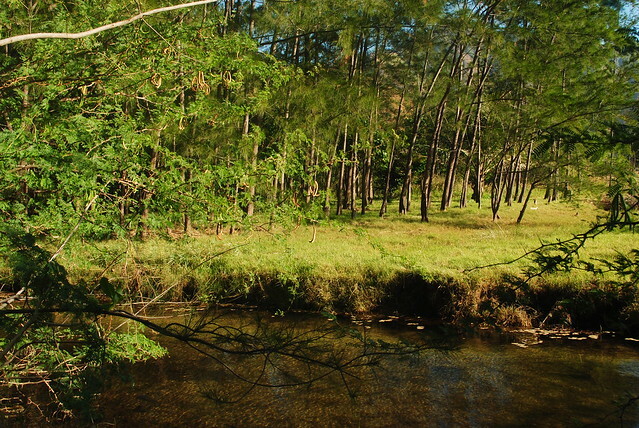 The creek at Nagsasa offers endless possibilities and opportunities . 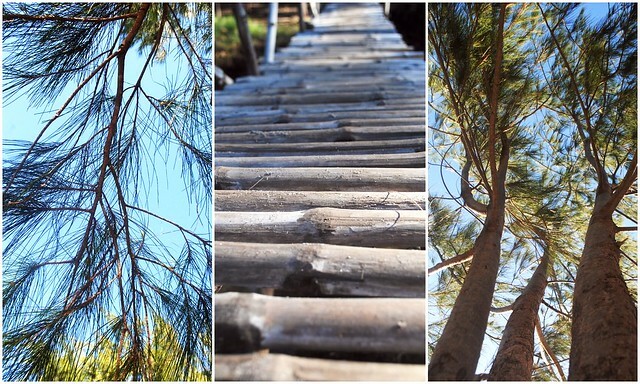 I spent the entire morning staring out into the ocean.Stairing at those pine trees as it dances with the wind. I felt the soft sea breeze and gentle warmth from the daylight sun. Looking at these breathtaking view in the cove made me realize that life is so beautiful. The cove is so alive . I joined the rest of the group and tried to feel the cold water. My feet landed in the softness of the sand . I felt the water gently trickling down on me. We really enjoyed the trip. 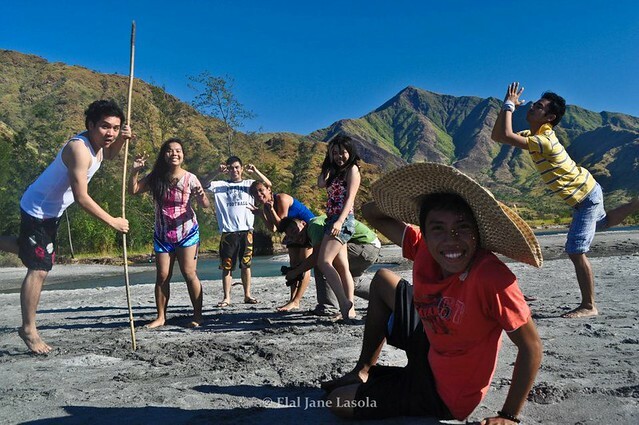 It was really a fun camping environment so I bet you will like it when you visit Nagsasa Cove. I know , I have said these many times already. Everything in this world is unique.That sometimes, sitting and watching birds fly or staring at flowers or just by watching a leaf on a tree dancing to the rhythm of the wind makes me feel happy and invincible. Simple pleasure is the best ! I am a happy soul . I appreciate little things in life. 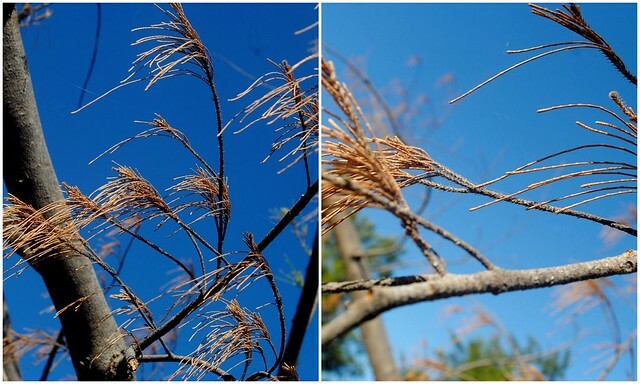 Loving the nature and environment. Our boatmen arrived at exactly 9:30 but we didn’t want to get out of the water. Getting out of the water was a torture. Ayaw talaga namin umalis dun. Labag sa loob ko ang umahon sa tubig. 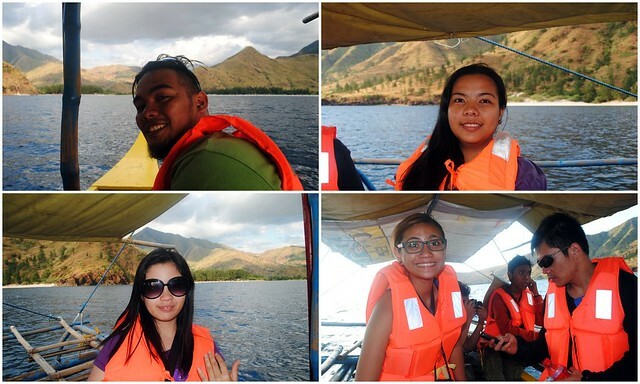 Next thing we found out , We boarded our boat at Nagsasa and sailed straight away to our next destination. Yes, we were sailing to the next island , Capones Island. 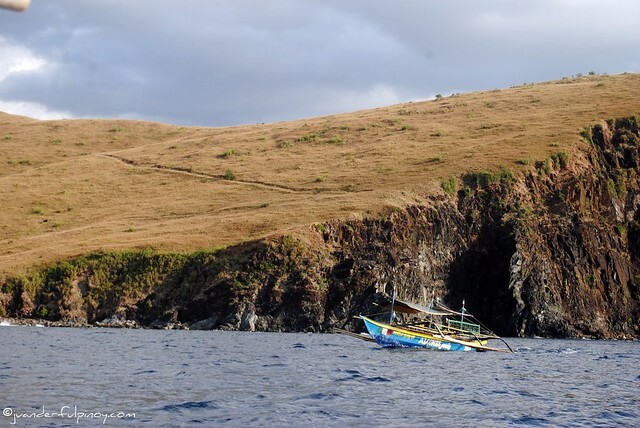 We anchored ultimately on an amazing coves of zambales . I know , I will be coming back. Thanks for the good memories Nagsasa.